This weekend, Danish-Argentinian artist couple, Thyra Hilden and Pio Diaz vistually set the colosseum on fire, with their new video installation, part of their” city on fire” art work series. Video images of fire were shown on screens put up inside the arches facing the via dei fori imperiali, to create the effect of the Colosseum burning. Inside the amphitheater, a massive floating light bulb was projecting light from behind the screens. The resulting effect was very interesting, not so much because of the illusion of fire, but more for the special atmosphere it created around the Colosseum. 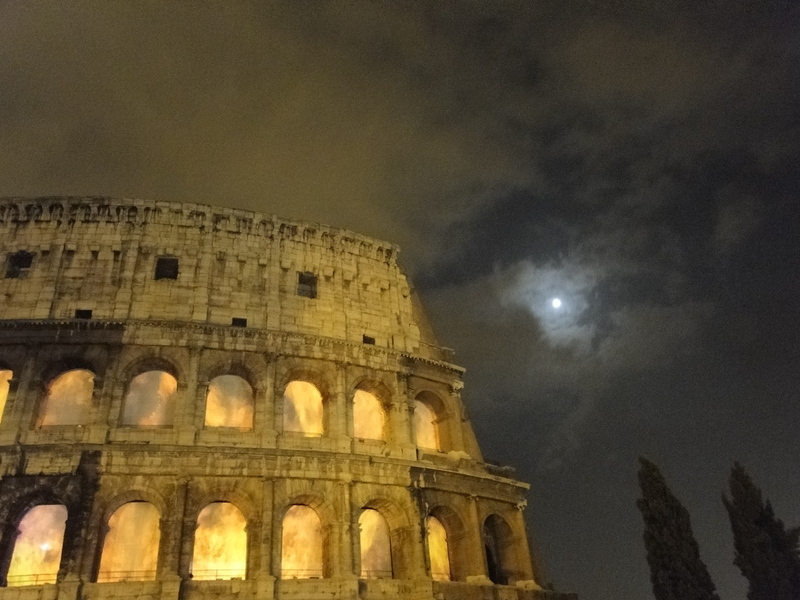 Just like two thousand years ago, Romans came on purpose to the Colosseum to see a show. No longer was it an open museum piece, but it became alive again as a venue. People were relaxed, friendly and ready to waste time, because they went there to be entertained. They were laughing and chatting while looking at the giant screens. It became an experience, rather than a passive show. In some ways it reminded me of Danish artist, Olafur Eliasson’s sun created for London Tate Modern’s Turbine Hall in 2003, which unexpectedly became more than a work of art to be seen. At the time, some commentators described it almost as a new place of worship, where the public bonded while sitting on the floor, meditating in front of the artificial indoor sun. Technically, the images on the old Flavian amphitheatre were reminiscent of videos by American artist Bill Viola, who has worked a lot around the elements, fire and water in particular. The atmosphere however was very unique to that one installation. This entry was posted on September 18, 2010 by Salambo in Arts and culture, Contemporary Rome, English and tagged Ancient Rome, burning, Colosseum, contemporary art, installation, italy, Rome, Vespasiano.